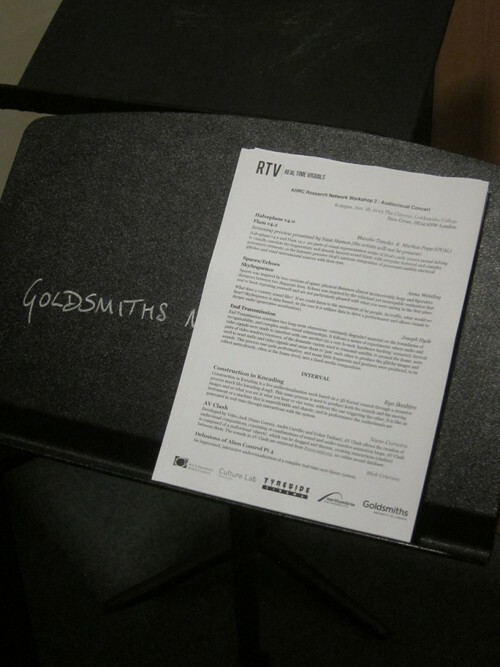 On Wednesday 18 June, the second Real-time Visuals research network Workshop was held at Goldsmiths, University of London, exploring a range of approaches to process and systems-based sound/image relationships. 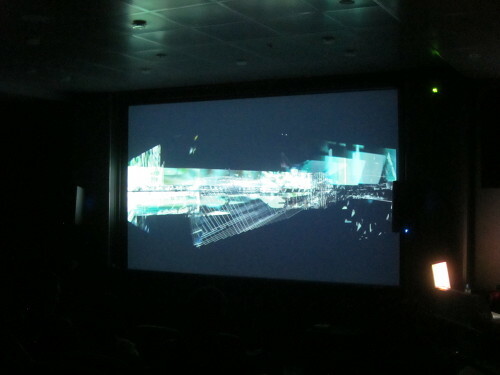 The event brought together an international group of artists, academics, performers, musicians, VJs, researchers and students working with audio-visual media. It consisted of a symposium during the day and a concert in the evening. The evening concert was held in the purpose-built Smaller Cinema. It’s a cosy, comfortable space that’s ideal for losing yourself in audiovisual art. The programme consisted of performances and screenings of works by artists who had presented earlier in the symposium. And so it was a good opportunity to experience the creative outputs from their research. Naut Humon presented previews of two works, Halveplane v4.0 and Flam v4.2, with music by Markus Popp of OVAL and visuals by Masako Tanaka. These have been produced especially for the CineChamber, RML’s mobile surround-screen structure. Anna Weisling followed with two performances: Spaces/Echoes and SkySequence. Visuals were manipulated live through a bespoke glove interface by Anna who remained off to the side of the screen. Joseph Hyde then screened End Transmission, composed out of edits of experiments from audio and video signals interfering with each other through TVs and other hardware. Abstract patterns interchanged with recognisable features, and the piece ended with hints of rave. After the interval, I performed Construction in Kneading, a live audiovisualisation of a 3D Mandelbox fractal. It both contrasts and complements the earlier Composition: White Square, White Cube as they’re both based on the same iterative process. Next, Nuno Correira performed a live performance using AV Clash, developed by Video Jack. Its a web-based application with an audiovisual interface using sounds retrieved from freesound.org. Finally, we were fortunate to witness the last ever performance of Delusions of Alien Control (Pt4) by Mick Grierson, a visceral, improvised and interactive audiovisual piece where both the sound and the moving image are generated by the same real-time non-linear processes. We look forward to seeing new works from him in the near future!